The script called for Warsaw to say his line with a “sinister smile,” something that was written before I designed the character. Oddly enough, even without traditional facial features, it does still read like a sinister smile to me in panel 1. But then I guess he ALWAYS looks like he has a sinister smile going on. I think the beats of this sequence came out really well. 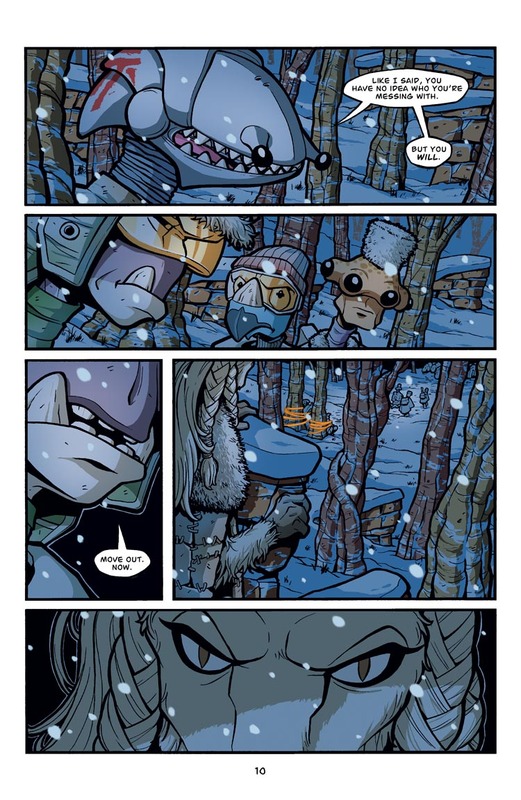 I especially like panel two, where Cember and Ril look to Roka with obvious concern. I imagine Roka himself is questioning whether to cut and run at this point or complete the job, based on the revelation of Kaagan-Vas involvement. And Roka does not abandon jobs lightly. Ooh, we are in deep snow now! the identity of the mystery character is killing me! When should we expect him to meet Roka and his crew? I think ‘him’ is actually a she. Perhaps Baso has a wife or sister that doesn’t like his new career path? Or perhaps wants to proof she can roll with the Kaagan-Vas too? All very interesting possibilities, Feroz! We’ll just have to see how on the mark you are. The mystery person will be revealed fairly soon and will have a big role to play in what happens with this particular run. Ooooh…suspense! Does the ship has it’s designated grease monkey with spots of grease on an overall yet? For some reason i can see one of Baso’s race being that. Unlikely to happen though.